Vinyl sales are up, and more and more of your fans want those really awesome LPs to add to their collection. But before you can get them in the hands of your fans, you have to order them. Ordering vinyl records can be a little complicated. We want to take some of the mystery out of the ordering process, so we’ve outlined the six things you have to keep in mind when placing your vinyl order. The first question to ask when you’re thinking about ordering any merch item is “Who will be buying this?” Take a look at your core audience and find out what they want. You could even send out a poll in your next e-newsletter (you do have an email newsletter, right?) asking if fans want vinyl, and if they do, would they prefer a turquoise record, or extended liner notes? Doing some initial market research and reaching out to your listeners before you purchase vinyl will help to ensure better sales down the line, and will set the stage for fan engagement when you do release the record. This is the MOST IMPORTANT step in the vinyl manufacturing process. Normal mastering for CDs and online distribution is completely different than mastering for vinyl. Vinyl is a truly analog medium, and the mastering techniques that make your music sound radio-ready will have the opposite effect on a record. Normal digital mastering can make your music sound washed out on vinyl, and can even cause skips and other playback problems. 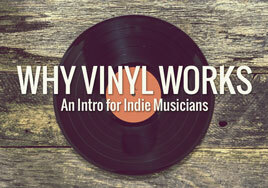 It is VITAL to have your music mastered by an engineer who is experienced in vinyl mastering. Be sure you figure the costs of mastering into your purchasing budget for vinyl. A CD can play about 74 minutes of music. A digital release will play for as long as you want it to. But vinyl is different. Each side of a vinyl record has a strict amount of playing time that can’t be exceeded. The reason for these strict time limits–besides the actual physical space allowed by the record– is that closer to the center of the album high frequencies become distorted, and volume level decreases. The closer you get to the center hole of the record, the quieter the volume becomes. If you know in the beginning stages of the album release process that you will be releasing on vinyl, try to order the tracks on your album with the limitations of vinyl in mind. Ballads or other soft tracks will sound better towards the inside of the record, and loud, boisterous tracks are better suited to the record’s outer edge. Try to arrange for your soft songs to be in the middle and at the end of your album so they will be cut towards the center of the LP. 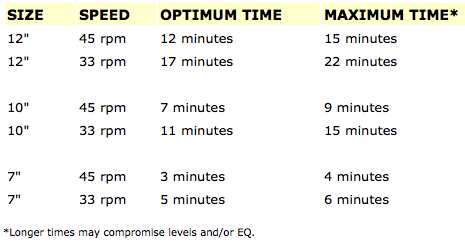 If this isn’t possible, you will want to have less than the maximum allotted time, so there are less discrepancies in volume and EQ. When your album is only released digitally, sometimes album artwork can be an afterthought. Fans don’t really see the artwork, and if they do, it’s usually on a tiny screen. But with vinyl, your album artwork is on full display. It’ important to invest in making your album artwork fantastic. Spend some time making sure your art is in the correct format for printing, that the art is high quality, and has proper bleed. You also need to make sure that your album artwork is representative of your music and brand. Digital distribution can take anywhere from 5 minutes to 5 weeks. CD manufacturing usually takes between 3 and 15 days. Vinyl manufacturing takes a solid 4 months (16 weeks). If you want to release digitally and on vinyl at the same time, you will need to do some serious planning in advance to make sure you can get your vinyl before your release date. If you need vinyl sooner, Nationwide Disc has created a way for you to get vinyl in as little as 30 days. Click Here for more information. 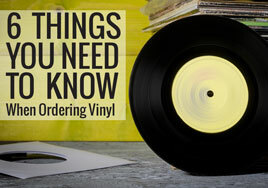 Have any other tips for ordering vinyl that you think other musicians should know about? Let us know in the comments below! First, you hear the low hum of the machine. Then a pop and a hiss, followed by the first lilting notes of a song . You could have popped your headphones in and listened from your first gen iPod. You could have pulled a CD out, or even hooked up your phone to your car via Bluetooth and listened to your music that way. But you, like an ever-growing number of people, have chosen to purchase the album on vinyl. Whether you are an avid collector of vinyl records, or if you’re a bit puzzled by the trend, it’s impossible to deny, vinyl is making a comeback in a big way. Every year since 2008, vinyl sales have been increasing. In 2014, vinyl sales were up 52%, while regular album sales were down 9.2% from the previous year (Billboard Magazine). Right now, vinyl is one of the best selling music products. The phenomenon is crossing genres, and affects independent musicians and major labels alike. So what do independent musicians need to know about vinyl, and how can YOU use vinyl to help create super fans and make money? Lets look at two of the major factors in play for indie musicians. Vinyl has grown leaps and bounds in recent years, but it’s still not quite broken into the mainstream. Right now it’s still a niche market, though that niche is getting bigger all the time. Fans are looking for a way to really experience the music (that’s why concert ticket sales are also rising!). People across all age groups and demographics are buying vinyl. The people who buy the most vinyl are avid music consumers across formats. They are the kinds of fans who will pre-order the album even though they can listen on Spotify for free, and who buy the merch bundle instead of just the t-shirt. The great thing about that? Those are the fans you want in your court. Those are the fans you want to forge lasting relationships with. And vinyl is a great way to do that. Not only is there great demand for vinyl among the heavy music consumers, vinyl is reaching it’s way into the lives of more casual listeners. Record players are inexpensive, and major retailers like Barnes and Noble and Urban Outfitters have started carrying LPs in their stores. Vinyl is creeping back into the mainstream, and people are buying. One of the concerns we hear most often from independent musicians is that vinyl is simply too expensive up front to justify having it as a regular staple on your merch table. While vinyl does have a much higher initial cost than other formats, if you plan your purchase right, vinyl could put a lot more money in your pocket than it originally took out. At Nationwide Disc, the average cost for 12” vinyl LP is between $9 and $11, depending on how many your order. That is a larger upfront investment than digital distribution or CD manufacturing, but vinyl can bring a big return on your investment. The great news for independent musicians is that you can sell that vinyl for more than double what you paid for it, or more! The base retail price for a 12” record is usually around $25. That means that with the sale of one record, you are making double your cost. That’s 200% profit! And that $25 price tag can go up pretty quickly if there is any exclusivity associated with the pressing. Limited edition pink vinyl? Sell it for $30. Exclusive liner notes that only come with the vinyl? You could sell that for $35. Brand new, exclusive-to-vinyl cover art? $40. Super-limited edition (as in only 15 of them exist) test pressing? Depending on your fans, you could sell those for upwards of $100! All these things are examples of things that you can easily do to increase the retail value of your record. And the great news is, fans who are ready to buy vinyl are ready to pay for these upgrades. They are generally the kinds of fans who deeply value the music they listen to, and the artists that create it. They get excited about forging a deeper connection to the artists they love through a physical album that looks—and sounds— amazing. So now that you know some of the benefits of vinyl for the independent musician, check back next week for expert tips on manufacturing and marketing vinyl records. Have you tried pressing your music to vinyl? How did your fans respond? Let us know in the comments below!